Three hundred years ago today, five Jacobites were hanged in London for raising a riot on behalf of the exiled Pretender. The 1714 childless death of Queen Anne had put the succession question on the political map in England. The Catholic Stuarts who had been run out of the realm a generation before were still hanging around in exile, claiming the throne — now in the person of “the Old Pretender”, James Francis Edward, the son of King James II who meant to become King James III. But the Whig party instead saw to the succession of Anne’s Protestant cousin, George I, the Elector of Hanover who would therefore become the fount of the Hanoverian dynasty — a change at in the executive that was matched by a parliamentary revolution that set the Whigs up to boss Britain for the best part of the 18th century. As conspiracies and rebellions unfolded among lords, for the London commoners the parties picturesquely (but no less violently) divided at the tavern doors. In the streets, the mobs were Tory: the importation of some German noble in preference to numerous English claimants more closely related to Anne than he had obvious grievance potential. Whigs in their turn set up politicized tavern clubs — “Mug Houses” — as vehicles to counterpoise a pro-Hanoverian presence, and these houses became an obnoxious presence to Jacobites wont to attract violent attack. Mug House Whigs and Jacobite/Tory mobs bloodied the flagstones with street brawls in 1715-1716, not neglecting to sing taunting partisan doggerel at one another good enough to swell the cockles of any modern-day football hooligan. They equip their roaring crew for action. And boast a great victory they’ve got. Can make their mightiest hero to quiver. 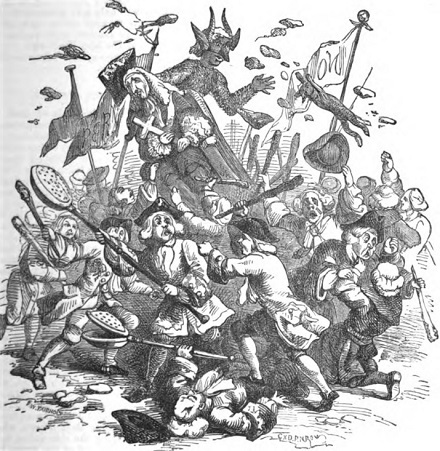 In July of 1716, a noisy Whig party at a Mug House in Salisbury Court had been attacked by a Jacobite mob. Though the siege had been repelled on the first occasion, July 20, rioters reorganized and returned for another go and there battered in the doors and ran amok on the lower floor, while their Whig belligerents remained trapped above. Gleefully the rioters sacked their enemies’ refuge, toasting the Pretender’s health with the Whig ale before a none-too-timely arrival of gendarmes finally dispersed them. Finally resolved to tamp down on the riots they had so long winked at, the crown threw the book at the rioters and got five condemned to hang on charges of burglary and assault. 1. George Purchase, condemn’d for being concern’d in the Riot in Salisbury-Court, Fleetstreet, on Tuesday the 24th of July last. He said, he was 23 Years of age, born at Puddle-Dock, London: That he serv’d an Apprentiship of 7 Years with a Shoemaker in Salisbury-Court: That when his Time was expir’d he became a Journeyman to his said Master, and never did an ill thing before this Fact for which he is condemn’d, and which he rashly committed, not considering then (as I endeavour’d now to make him sensible of) the Unlawfulness and dismal Consequences of such a Rebellious Sedition as that was, which so much tended not only to the Ruin of private Persons, but to the great Disturbance of, and Dishonour to, the whole Government. I representing both to him and his Fellow-Criminals and Sufferers, what perfect Nonsense (not to say worse) it was for them to cry-out, High-Church and Ormond; and what an unheard of Impudence and Disloyalty, what an enormous Wickedness and Impiety they all discover’d to be in their Nature, by their uttering these and the like Rebellious and Malicious Expressions; Do Hannoverian, King George, Down with the Mugg-house, &c. by which they excited and stirr’d up both themselves and others, to kill and plunder, to set the Nation in a Flame, and, in a word, to do all the Mischief they could, and to which (no doubt) they were greatly encourag’d underhand by such as neither fear GOD, nor honour the KING; nor indeed have any true Love for, or Regard to the Lives of those poor silly Tools they made use of in that Riot. Upon this my Observation and Admonition (endeavouring to convince them, that they could have no good Intent in doing what they did, but quite contrary) this George Purchase acknowledg’d it to be a heinous Crime, himself greatly Guilty, and his Sentence just; praying GOD to forgive him this and all other his Sins, and have Mercy upon his Soul. 2. Thomas Beane, condemn’d for the same Fact. He said, he was 22 years of age; born in Salisbury-Court, where his Father formerly kept the Ship Tavern: That he was 5 Years at Sea, as Servant to the Purser of a Man of War , whom he serv’d the last of those 5 Years in the capacity of his Steward: That he was a Servant to some Gentlemen unhappily engag’d in the late Rebellion at Preston, since they were in Newgate, and not before. As to this Fact he was condemn’d for, he confest his guilt of it, acknowledging in particular that he carried part of the Mug-house Sign about the Street, and at last threw it into a Cart; but withal endeavour’d to palliate it, saying, That he inconsiderately join’d in that Riot, the dismal Consequences whereof he did not then apprehend, but now (to his great Sorrow) knew the Mischief he had thereby involv’d himself in. 3. William Price, condemn’d also for the same Riot. He said, he was 21 years of age, born in the Parish of St. Andrew Holbourn: That he was bound Apprentice to a Sword-Cutler , and had now serv’d 4 years of his Time, and never committed any Crime before this Riot hapned. He confess’d, That, hearing there was a great Concourse of People in Salisbury-Court, he presently ran thither, but said withal, That it was with no ill Intent, but out of meer Curiosity; however, when he was come he join’d with others there, and assisted them in demolishing Mr. Read’s Mug-house, destroying his Goods, and crying, high Church and Ormond, &c. Upon which Confession of his, I shewing him the heinousness and mischievous Consequences of that wicked Fact, he began to be sensible, and said, he heartily repented of it, praying GOD to forgive him this, and all other his Sins. He also was much concern’d to hear that his poor Mother had been misrepresented by some Persons, who had reported, that she us’d no Endeavours to save his Life; for he was fully satisfied she did that to her utmost. 4. Richard Price, condemn’d likewise for that Fact. He said, he was 20 Years of age, born at Llangdavery in Caermarthenshire in Wales, where having serv’d his Time with a Taylor , he came up to London, and here wrought Journey-work , and never engag’d in any ill thing before this hapned; adding, That accidentally passing by that Place where the Tumult was, he unhappily fell in among ’em, not considering the Unlawfulness and ill Consequence of such a Fact. He was very ignorant, and could not so much as read, which was a great disadvantage to him under these his melancholy Circumstances. I endeavour’d to make him sensible of his great Offence, and to beg Pardon for it, and all other his Sins; which he accordingly did with Tears. 5. John Love, condemn’d for being concern’d with the ‘forementioned Rioters. He said, he was about 16 years of age, born in White-Fryers, London: That he had learnt to make Buttons , but his chief Employment was, the helping of Bargemen and Lightermen to unlade their Boats . He further said, That he never was (nor ever deserv’d to be) brought before Justice till this Riot happen’d, in which he unfortunately involv’d himself, without considering what he then did, or what might follow thereupon. I found him a very ignorant Person, who could not read at all, and hardly knew any thing of Religion; and he was, for some Days past, so very sick and weak, that I was forced to attend him in the Condemn’d Hold; so all I could do there was, to pray for him. At the Place of their Execution, whither they were this Day carried in two Carts from Newgate, I gave them my last Attendance, exhorting them still more and more to repent of this and all other their Sins. I pray’d and sung some Penitential Psalms with them, and made them rehearse the Apostles Creed. They desir’d, that all young Men and others would take Warning by them, and learn Wisdom from their Folly. They also desir’d the Standers-by to pray for their departing Souls: They begg’d Pardon of GOD and of the KING, and of all they had offended; and declar’d, That they dy’d in Charity with all Men; wishing that none would be so unhappy as to follow them in this, or any other Evil Course, that might bring them to an Untimely End. After this I pray’d with ’em again, That God would grant ’em the Pardon of their Sins, and the Salvation of their Souls; that they might have a happy Passage out of this miserable Life, and be admitted into a State of Everlasting Bliss and Glory. Then I withdrew from them, and left ’em to their private Devotions, for which they had some Time allotted them: When that was expir’d, the Cart drew away, and they were launch’d into Eternity, they all the while praying to GOD to have Mercy on them, and receive their Souls. This sharp show of resolve evidently did do the trick, as Mug House disturbances came to an abrupt end thereafter.